Industrial designer Ivan Zhurba came out with a brilliant idea to tackle the planned obsolescence of iPhones. 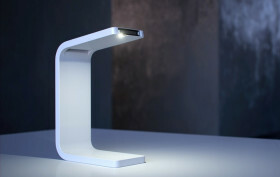 His “iPhone Lamp” is an elegant luminaire for the desk or bedside table that gives new use to Apple’s retired smart phones. The lamp follows the tech giant’s sleek, clean lines, so you don’t have to worry whether it’ll fit in with your interior; just throw it into a modern upstate home or a teensy Upper West Side studio and enjoy the light.